Searching for a delicious and nutritious dessert? Use fruit to make a healthy dessert that is sure to satisfy anyone’s sweet tooth. Use a small bowl to stir together the flour, cinnamon, and baking soda. Add to sugar mixture. Stir in oatmeal. Line a baking sheet with aluminum foil and spray with cooking spray. Spread the dough in a 9-inch circle. Bake about 12 minutes. Crust will begin to puff but does not look done. Remove from oven and let cool about 20 minutes. The crust continues to cook while cooling. Use a small bowl to stir together the cream cheese and yogurt until smooth. Cover with plastic wrap and refrigerate until cool. Cut into wedges and serve, or refrigerate up to 2 hours, covered and uncut. 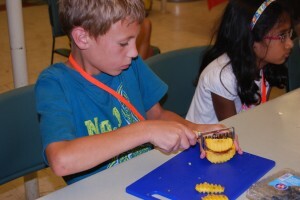 This entry was posted in Camp Blog, Recipes and tagged Fruit Pizza, Recipes, Tollgate Education Center Programs. Bookmark the permalink.